This post is the permanent home for the instructions for the Contactor Adapter. 1.4: Increased creepage distances for improved safety and isolation. Contactors are very similar to relays. Classically, the term is used to describe relays that switch higher powered loads on and off, and typically have AC line voltage powered coils, while relays tend to be smaller and have low voltage DC coils. The initial project that drove the design of the contactor adapter was OpenEVSE. The OpenEVSE and Hydra boards had switched 12 volt outputs designed to open and close relays to turn the power to the car on and off. 30A DSPT relays were not hard to come by, but they came with QD terminals. QD crimp terminals for 10 gauge wires can be had, but in heavy usage they were not reliable. Switching to contactors resulted in a much more reliable design for the high-current paths, but led to the need for the contactor adapter. To make use of the adapter, first pick a contactor with a coil whose voltage matches the voltage of the load that you're going to switch. The contactor adapter is rated for 240 VAC RMS maximum (it can be used at 120 VAC as well). Insure that your contactor coil draws no more than 100 mA (most won't) not counting initial surge currents. The contactor adapter's high voltage terminals are a switch. Wire the contactor so that one coil terminal is fed directly from one of the line inputs. Wire the other contactor coil terminal to one of the contactor adapter's high voltage terminals. Wire the other contactor adapter terminal to the other line current source. If you're using hot-neutral wiring, then you should place the contactor adapter in the hot line rather than the neutral line. If you're using hot-hot wiring, then it does not matter which hot line you use. The input side of the contactor adapter is effectively an LED. The contactor adapter is supplied with a 330 ohm series resistor, which means that the ideal switching voltage is 12 volts. The contactor adapter will draw approximately 30 mA. If you wish, you can replace the series resistor with a 150 ohm one, in which case the contactor adapter can be driven directly with a (5 volt) output pin from a microcontroller (assuming that that one pin can drive 30 mA). 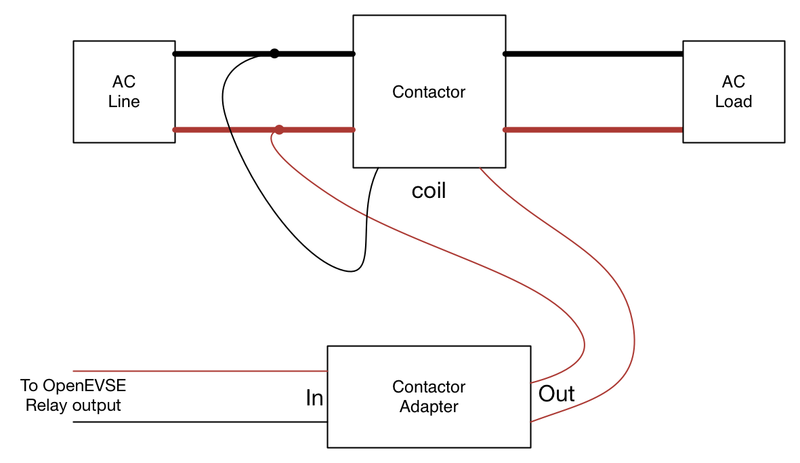 Unlike relay coils, the contactor adapter is polarized. You must connect the positive terminal to the voltage source and the other terminal to ground. For OpenEVSE boards, the common center pin of the relay terminal is positive, the individual relay pins are ground. Note that most of the board has line voltage present when it's connected - and this includes the bottom of the board. Mount the board securely with appropriate mounting hardware, including standoffs to keep the bottom of the board a minimum of 1/4" away from anything else.